Have you ever heard an attorney or someone else say that they need to make a record? A record can mean recorded or written statements, reports, emails or other correspondence, medical, school or employment records, and photographs. Written documentation to demonstrate liability or to prove damages are essential in a car accident case, but often the most powerful evidence in a personal injury case is the photographs. We enlarge and mount them up for every jury trial. You can describe a horrific accident or injury but the real impact of what has occurred or resulted from an accident comes from car accident photographs that depict the severity of the collision and the extent of an injury. Seeing a crushed roof and smashed windows of a car on its side more clearly illustrates the truth of the accident. Similarly, photographs of the victim with blood streaming from a wound or with other obvious injuries can be the key to that victim collecting the compensation to which he or she is entitled. Creating a record of your personal injury accident with photographs can be done by anyone who is involved in any kind of personal injury accident. The following is a guide for how to take car accident injury photographs. Property damage to both vehicles. 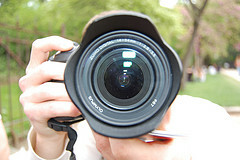 Use different angles and take close-ups and distance shots. If there is debris on the roadway from either vehicle, photograph this as well. Photograph the road surface and note if there are potholes or other flaws. Take photos of road signs, traffic signals, poles, median or guardrail even if not directly involved in the accident. If there are skids, photos and measurements may indicate the speed of that vehicle, which can be definitive in establishing causation. In winter or rain, photograph the snow or wintery conditions and water on the road surface if observed. Take photographs of the parties involved. You do not have to ask their permission but you might not want to be obvious. Include passengers, police, EMT personnel and of anyone else who rendered assistance. Photos of your injuries or those of your passengers can be powerful and will make an impression on the defendant’s insurer and a jury if it goes to trial. This includes cuts and bruises, head wounds, broken limbs, and cuts or lacerations. Follow up photos of your injuries by taking shots days or weeks later of you in a hospital room with bandages or of your limbs in casts or slings or with a medical device. You can zoom in for photos of surgical sites and scars, taking care to use different angles. You can also create evidence by documenting the progression of your injuries with photos taken days or weeks apart. Note that any extraneous material or clutter or other people should not be in your personal photographs. These are pieces of car accident evidence that could be admitted at trial. Your demeanor should reflect the seriousness of the situation so smiling is not a good idea, nor is wearing jewelry or makeup. Have your photographs put in a CD or USB flash drive so that they are preserved and easily accessible. Provide the photos to your lawyer. DO NOT PUBLISH THE PHOTOGRAPHS ON SOCIAL MEDIA! If you or a loved one has been injured in a car or other personal injury accident, promptly contact personal injury attorney’s Neil Burns and Roshan Jain. Getting legal representation at the outset can help you avoid grievous errors and misjudgments if you try to handle your injury claim alone. Insurance defense adjusters are not investigating your accident for your benefit and will attempt to place any degree of fault on you or seek to minimize the nature and extent of your injuries and damages. And they will have their own pictures, taken by professionals. Burns & Jain have been representing the interests of accident victims since 1985 and throughout the Commonwealth of Massachusetts. We can examine your accident scene photographs, advise you on what other photographs could benefit your case, and if additional investigation is needed to prove liability or to substantiate your injuries and damages. Call our office today for a free analysis of your injury claim.